Freddy and his uncle are working in a medical warehouse with canisters containing zombies in the basement. When one of them gets cracked the gas released re-animates a corpse and Freddy and his uncle chop it up and then decide to burn it at the crematorium across the street, unfortunately for them it sends gas into the air and then it rains and re-animates the entire graveyard. 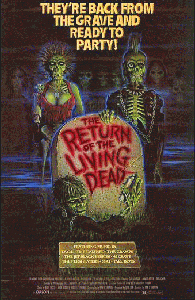 This is great fun, the original zombie comedy movie which manages to find a balance between over the top gags and moments of gory horror. Thom Matthews and James Karen form a fantastic double act which is really entertaining and the direction and effects are excellent considering the low budget. The film has a terrific sense of fun but unlike many so called horror comedies of recent years it remembers that it is a horror film as well.